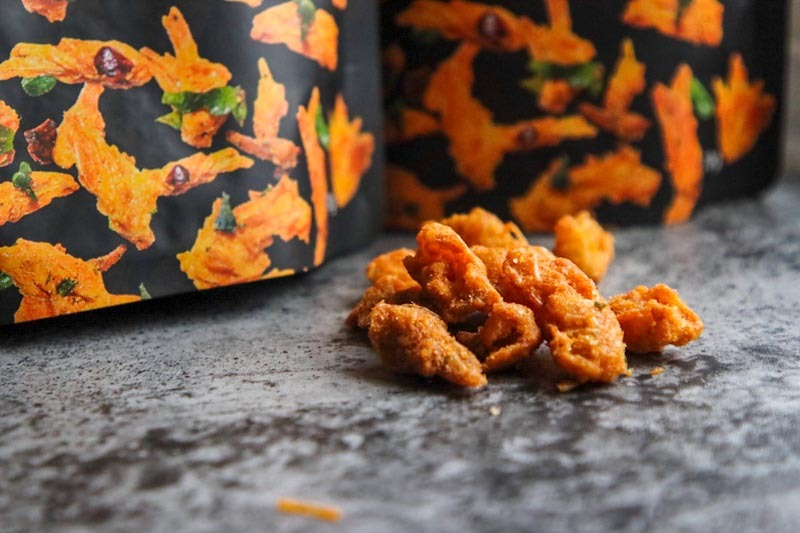 We’re sure it’s only been a while since we were all eager to get our hands on the highly coveted Irvin’s Salted Egg Fish Skin. But recently, we discovered a whole new snack that might be the next in thing, or raise some eyebrows first, at least. 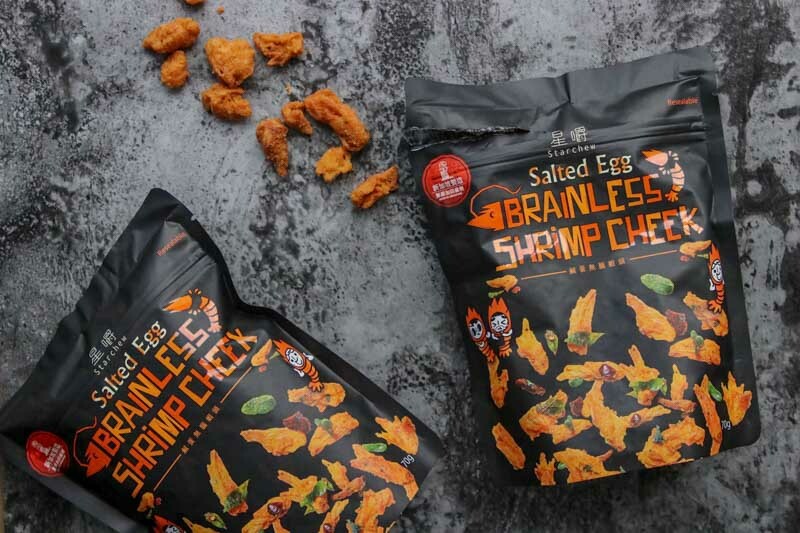 The bizarre Salted Egg Brainless Shrimp Cheek snack may sound weird, but I’m sure it’ll grow on you almost immediately. Just what exactly is brainless shrimp cheek? It’s actually the lower part of the shrimp head which resembles the crustacean’s ‘cheek’. All the guilt-inducing, high-cholesterol parts (mainly roe and brain) are removed, leaving it as an empty shell or simply “brainless”. 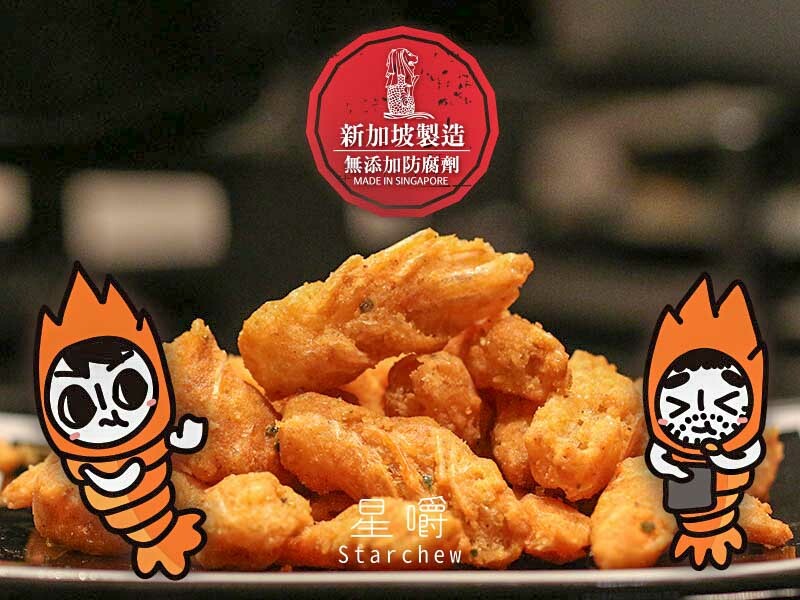 We tried Star Chew’s Salted Egg Brainless Shrimp Cheek (S$9 per 70g), and it was love at first bite. The unmistakable richness of salted egg filled my mouth with every crunch. 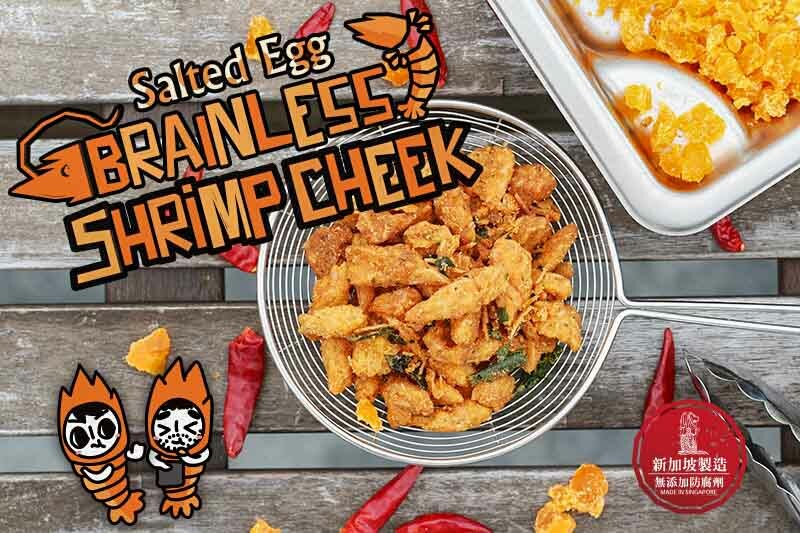 Equally strong in flavour, the briny prawn flavour was not overpowered by the salted egg. The two dominant flavours packed each bite with a complex, umami flavour. It was rather airy, making it easier to bite through than fried fish skin which is sometimes too tough. 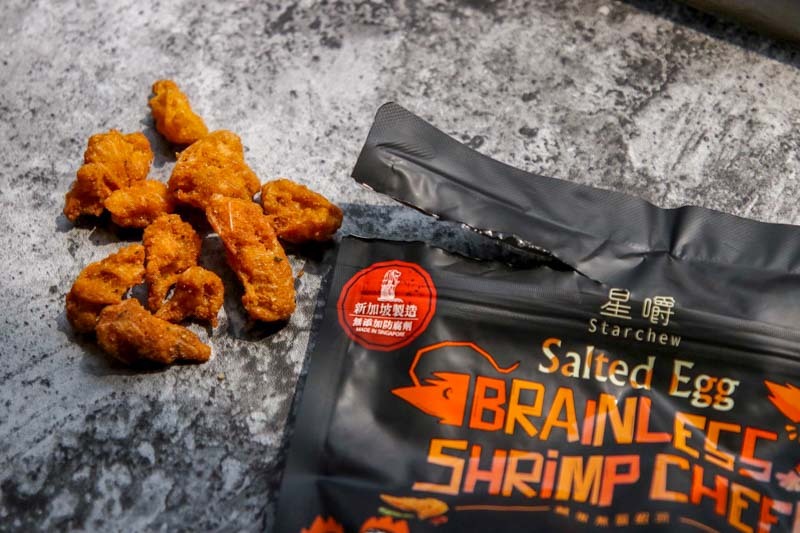 I also liked the consistent bite-sized quality of the shrimp cheeks, which made it a breeze to munch through the entire packet in no time. With the cholesterol-rich parts all removed, snack time will be a little less guilty for you. I’m a huge fan of prawn and fish crackers, so this snack definitely topped the charts for me. I must warn those of you who aren’t fans of seafood that it might be too briny for your liking. Love something spicier? 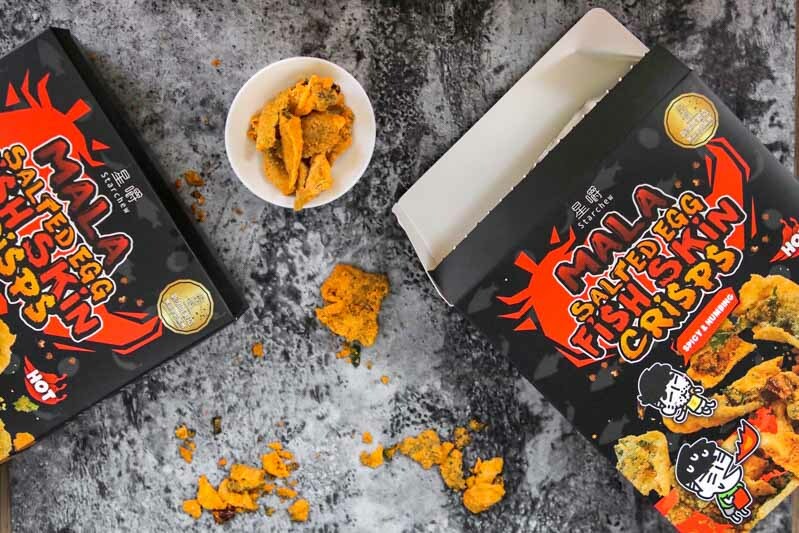 We’ve got you covered with good ol’ Ma La Salted Egg Fish Skin Crisps (S$9 per 110g) from Star Chew. Savoury and spicy, the mala flavour was extremely fragrant. While I still prefer the airer crunch of the Salted Egg Brainless Shrimp Cheek, this classic snack still makes an impression. Even though it’s spicy and increasingly numbing, I couldn’t seem to stop myself from finishing the packet. Our chilli-fearing friends may still want to stick with the non-mala version available. A little disclaimer: you might want to be a little shellfish with this snack. Psst, you can now indulge round the clock with various Star Chew snacks available at the Balestier Dojin outlet that’s open 24 hours.